Since its opening in 1885, W.S. 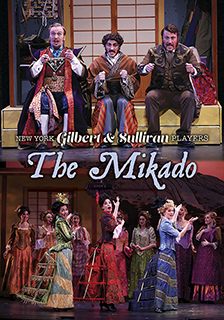 Gilbert and Arthur Sullivan’s comic opera, The Mikado, has remained one of the most frequently performed works in musical history. This latest critically lauded production emerged from the committed work between the New York Gilbert and Sullivan Players and the New York Asian American theatrical community, resulting in a fresh historical context and diverse casting. The action begins in 1884 at the D’Oyly Carte Theater Company, where Gilbert and Sullivan meet with their producer, Richard D’Oyly Carte, to plan their next opera. What ensues is a dreamy love story satirizing Victorian culture, all set in a fictionalized Japan. A fantastical journey awaits!